This website is operated by Tremed Ltd. (company ID 512536566), the official distributor of L'OCCITANE En Provence in Israel. or by e-mail: sharona@tamar-mrkt.com or using contact us form in the website. Most purchases are shipped from our warehouse in Rishon Leziyon by a temperature controlled courrier to your home/office and should arrive within 3 - 7 business days from receipt of your order and confirmation of payment. It is L'OCCITANE's intention to satisfy our customers. For this reason, we will gladly issue a full refund to the original credit card for any unopened merchandise that is returned within 14 days of the date of purchase. After 14 days, a store credit or exchange will be issued for any unopened merchandise returned. Items purchased with cash maybe be exchanged or a store credit issued. There are no cash refunds. All items must be accompanied by the original receipt and in unopened, saleable condition. The purity apply product higer than 50 NIS. Any return of product or service cancellation will charge you a cancellation fee of 5% of the product or service, or NIS 100, based on the lower of the two options. Please allow two weeks from the day you return your package for your request to be processed. Gift cards are available for purchase on line in any denomination of 50NIS, 100NIS, 200NIS or 400NIS. 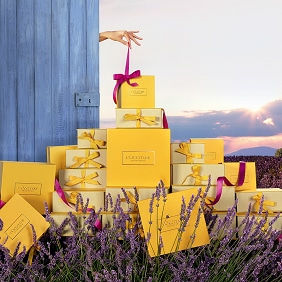 Gift Cards are available for redemption on-line and at any L'OCCITANE boutique. When you purchase your gift certificate regular shipping charges are added. You cannot enjoy the benefits of the implementation Club gift card but only when purchasing a ticket. We accept all credit card types: Visa, MasterCard, Diners and American Express. We do our best to ensure that all information published on the il.loccitane.com website is accurate and current. We reserve the right to update and make corrections to information on the website at any time and without warning. We will not be held liable for any inaccurate information or for any information that has been omitted from the website. L'OCCITANE products displayed on the website are available while supplies last. The prices displayed on the website are quoted in Israeli Shekels and are valid only in Israel. Price and availability information is subject to change without notice. In the event that a product is listed at an incorrect price, we shall have the right to refuse or cancel orders placed for the product listed at the incorrect price. The customer information that we have in our database is reserved for internal use only, we do not sell or hand out this information to anybody, meaning that we keep that information confidential. This information is only needed in order to get to know you better and to find ways to improve our service quality. (IP) שממנה פנית ועוד. Furthermore, we only save data to the extent that it is technically and commercially necessary. It is understood that legal entities of the L'Occitane Group as well as other authorized third parties might save data for operational reasons. This includes that we might use a third-party service provider to serve advertisements on our behalf across the Internet and sometimes on this site. We (including the aforementioned service provider) may collect anonymous information about your visits to our website, and your interaction with our products and services. We might also use information about your visits to this and other websites to target advertisements for goods and services. This anonymous information is collected by using a pixel tag, which is industry standard technology used by most major websites. No personally identifiable information is collected or used in this process. They do not know the name, phone number, address, email address, or any personally identifying information about the user. If you would like more information about this practice, and to know your choices about not having this anonymous information used by our 3rd party service provider, you have a right to get information on the use of your data for free. Please do not hesitate to contact us by e-mail: loccitane@tamar-mrkt.com or by mail to address: Tremed Ltd. (company ID 512536566),30 Eliyahu Eitan St. Rishon-Leziyon, Israel.